First-half goals from Tamas Priskin and Gareth McAuley were enough for Ipswich to see off Millwall and reach the fourth round of the Carling Cup. The home side started well but Priskin put Ipswich in front with a looping header from Andros Townsend's cross. Gareth McAuley added a second for the visitors when he met Townsend's driven free-kick with an outstretched leg. Steve Morison's neat finish reduced the deficit but Town survived some late Lions pressure to seal their progress. It was another setback on home soil for Millwall manager Kenny Jackett and his side, who were unbeaten at the New Den for 22 games before Saturday's 6-1 hammering by Watford. Morison should have given the south Londoners an early lead but he headed wide from James Henry's cross before Ipswich keeper Brian Murphy kept out efforts from the Welsh international and Scott Barron. Ipswich's opener came from their first attack of note, and Townsend went close to adding a second soon afterwards when his angled drive flew narrowly wide. Townsend, who was lively all evening, also had a hand in his side's second goal, which was converted by McAuley on the stroke of half-time. Chris Hackett missed a good chance for Millwall when Alan Dunne teed him up in front of goal, but the Lions did respond when Morison controlled Tony Craig's high cross to fire home after 62 minutes. The home side poured forward late on in search of an equaliser, and Morison headed over before Liam Trotter fired over the bar, but they could not find a way through. 90:00+4:31 The referee ends the match. 90:00+3:50 Headed effort on goal by Chris Hackett from inside the penalty box misses to the right of the goal. 90:00+2:28 Connor Wickham concedes a free kick for a foul on Tony Craig. Free kick taken by David Forde. 90:00+1:30 Foul by Steve Morison on Gareth McAuley, free kick awarded. Brian Murphy takes the direct free kick. 86:42 The assistant referee flags for offside against Connor Wickham. Free kick taken by David Forde. 85:47 David Forde takes the direct free kick. 85:47 Booking Connor Wickham is shown a yellow card. 85:42 Free kick awarded for an unfair challenge on Alan Dunne by Connor Wickham. 85:02 Foul by Chris Hackett on Jaime Peters, free kick awarded. Mark Kennedy takes the free kick. 82:52 Connor Wickham challenges Paul Robinson unfairly and gives away a free kick. Direct free kick taken by David Forde. 82:15 Tamika Mkandawire has an effort at goal from outside the area which goes wide left of the target. 81:20 Corner from right by-line taken by Scott Barron. 80:41 Steve Morison fouled by Gareth McAuley, the ref awards a free kick. Chris Hackett takes the direct free kick. 80:09 Shot by Chris Hackett. Grant Leadbitter gets a block in. Chris Hackett takes a shot. Blocked by Grant Leadbitter. 79:31 Free kick awarded for a foul by Connor Wickham on Tony Craig. Direct free kick taken by David Forde. 77:41 Liam Trotter takes a shot from deep inside the box clearing the bar. 75:20 Corner taken left-footed by Scott Barron, Unfair challenge on Gareth McAuley by Steve Morison results in a free kick. Brian Murphy takes the free kick. 74:45 Luke Hyam has a shot on goal from outside the box which misses left. 73:33 Corner taken right-footed by Chris Hackett from the left by-line, Header on goal by Steve Morison from inside the box goes harmlessly over the target. 70:34 Darren Ward fouled by Connor Wickham, the ref awards a free kick. Free kick taken by Tony Craig. 69:28 Direct strike on goal from the free kick comes in from Grant Leadbitter, save by David Forde. 69:28 Booking Liam Trotter is cautioned by the ref for unsporting behaviour. 68:59 Liam Trotter challenges Luke Hyam unfairly and gives away a free kick. 67:13 Free kick awarded for a foul by Tamika Mkandawire on Jason Scotland. Mark Kennedy takes the direct free kick. 66:25 Grant Leadbitter takes a outswinging corner to the near post, Steve Morison makes a clearance. 65:56 Grant Leadbitter takes a outswinging corner from the right by-line played to the near post, clearance by Paul Robinson. 63:35 Substitution Connor Wickham on for Tamas Priskin. 61:49 Assist on the goal came from Tony Craig. 61:49 GOAL - Steve Morison:Millwall 1 - 2 Ipswich Steve Morison grabs a goal from inside the penalty box high into the middle of the goal. Millwall 1-2 Ipswich. 60:12 Free kick awarded for a foul by Scott Barron on Luke Hyam. Brian Murphy takes the free kick. 57:34 Substitution James Henry goes off and Neil Harris comes on. 57:34 Substitution Darren Ward comes on in place of Danny Schofield. 57:34 The assistant referee flags for offside against Jaime Peters. Free kick taken by David Forde. 53:56 Unfair challenge on Luke Hyam by James Henry results in a free kick. Brian Murphy restarts play with the free kick. 52:56 Substitution Jason Scotland replaces Colin Healy. 52:56 Substitution Grant Leadbitter replaces Andros Townsend. 51:28 Free kick awarded for an unfair challenge on Damien Delaney by Steve Morison. Brian Murphy restarts play with the free kick. 50:37 Corner taken by James Henry from the left by-line, save made by Brian Murphy. 47:14 Foul by Danny Schofield on Tom Eastman, free kick awarded. Free kick taken by Brian Murphy. 46:44 Corner taken left-footed by Andros Townsend from the right by-line, David Forde makes a save. 45:00+3:23 The ref blows to end the first period. 45:00+2:30 Assist on the goal came from Andros Townsend. 45:00+2:30 GOAL - Gareth McAuley:Millwall 0 - 2 Ipswich Gareth McAuley fires in a goal from inside the penalty area to the top left corner of the goal. Millwall 0-2 Ipswich. 45:00+0:56 Scott Barron concedes a free kick for a foul on Jaime Peters. Mark Kennedy takes the free kick. 44:26 Shot from long range by Andros Townsend goes wide of the left-hand post. 43:17 Effort from the edge of the area by Tamas Priskin goes wide of the left-hand upright. 42:10 Long range effort from Andros Townsend misses to the left of the goal. 41:50 Corner taken left-footed by Andros Townsend from the right by-line to the near post, clearance made by Steve Morison. 41:08 Reggie Lambe takes a shot. Scott Barron gets a block in. 40:41 James Henry challenges Andros Townsend unfairly and gives away a free kick. Direct free kick taken by Colin Healy. 39:20 Andros Townsend fouled by Chris Hackett, the ref awards a free kick. Mark Kennedy takes the direct free kick. 36:47 Liam Trotter takes a shot. Save made by Brian Murphy. 36:05 The assistant referee signals for offside against Tamas Priskin. Free kick taken by David Forde. 34:35 Mark Kennedy delivers the ball, Effort on goal by Reggie Lambe from outside the box goes harmlessly over the bar. 34:35 Booking The referee books Alan Dunne for unsporting behaviour. 34:25 Alan Dunne gives away a free kick for an unfair challenge on Andros Townsend. 33:46 Colin Healy takes a shot from deep inside the box clearing the bar. 31:18 Effort from 25 yards by Reggie Lambe. Tony Craig gets a block in. Andros Townsend takes the chance to get an effort at goal. Blocked by Paul Robinson. 27:21 Free kick awarded for a foul by Luke Hyam on Chris Hackett. James Henry delivers the ball from the free kick right-footed from left wing. 26:49 Tamas Priskin gives away a free kick for an unfair challenge on Tamika Mkandawire. David Forde takes the direct free kick. 24:59 Free kick awarded for a foul by Andros Townsend on James Henry. Alan Dunne takes the direct free kick. Correction - 22:33 Andros Townsend provided the assist for the goal. 22:33 Reggie Lambe provided the assist for the goal. 22:33 GOAL - Tamas Priskin:Millwall 0 - 1 Ipswich Tamas Priskin finds the back of the net with a headed goal from inside the penalty area. 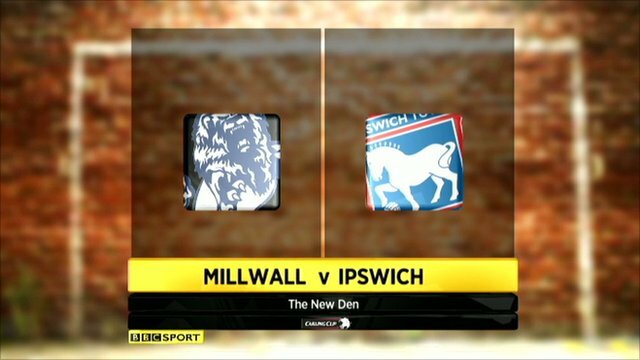 Millwall 0-1 Ipswich. 19:04 Andros Townsend fouled by Liam Trotter, the ref awards a free kick. Direct free kick taken by Mark Kennedy. 17:36 Foul by Alan Dunne on Tamas Priskin, free kick awarded. The ball is crossed by Colin Healy, Headed effort from inside the area by Tamas Priskin misses to the right of the goal. 16:47 Danny Schofield has an effort at goal from outside the area which goes wide right of the goal. 15:43 Shot by Chris Hackett. Damien Delaney gets a block in. 14:53 Shot from 12 yards from Scott Barron. Save by Brian Murphy. 13:30 Steve Morison takes a shot. Comfortable save by Brian Murphy. 12:23 Tamas Priskin takes a shot from 18 yards. David Forde makes a save. 11:09 Unfair challenge on Jaime Peters by Liam Trotter results in a free kick. Jaime Peters restarts play with the free kick. 7:24 Long distance shot from Chris Hackett misses to the left of the net. 7:00 Free kick awarded for a foul by Colin Healy on Scott Barron. Chris Hackett takes the free kick. 4:41 Free kick awarded for an unfair challenge on Paul Robinson by Tamas Priskin. David Forde takes the free kick. 3:44 Header by Steve Morison from deep inside the penalty area misses to the left of the goal. 3:17 Andros Townsend is caught offside. Indirect free kick taken by David Forde. 0:42 Danny Schofield is caught offside. Brian Murphy takes the free kick.